Guide to Alaska RV Rentals includes Alaska Motor Home Rentals and where to find them. Anchorage Alaska RV and Motor Home Rentals starting at just $80.00 per day. RV Rentals in Anchorage, Seward, Homer, Kenai, Soldotna, Fairbanks and more. Campers, Campervans, Motorhomes, Travel Trailers, Recreational Vehicles all for rent in Alaska. Alaska RV Rentals - Motorhome Rentals in Alaska! Thinking About Renting an RV this summer? Act by End of March and you could save a pretty sizable hunk of change. Motor Home Rentals in Alaska can be found on the internet, in forums and in rv classifieds too. 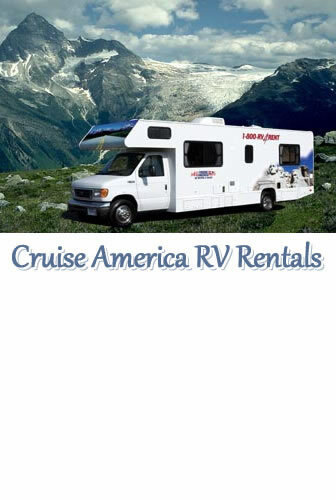 There is no better way to see Alaska than in a an RV rental from Cruise America in Anchorage AK. Possibly the best value in the Alaskan RV rental market these slide-in truck bed campers offer mobility that gets lost in the larger full sized motorhome and travel trailers.